Friday should be just another day of the week, but on Fridays everything ends. The week itself, the work, the anxious waiting for the aforementioned Friday, the early mornings and coffee breaks, and sometimes even wishing you were dead. But what if you didn’t spend your whole life waiting for it to be Friday? What if you spent your whole life in a constant state of enthusiasm at the prospect of the multitude of possibilities the next day could hold- Friday or not- Tuesday or Monday even? What if you lived for each new day instead of living singularly for Fridays? We spend so many of the seconds we have here on earth waiting for something to end. Whether it’s the pain of a fresh tattoo or a relationship we know in our hearts is going absolutely nowhere, or an agonizing social experience in which the only thing that helps calm our nerves is glancing at the clock. Even worse, we spend a third of our lives asleep. Curled up like commas and scrolls of parchment in our beds, hands clasped to cheek, bodies oriented with head toward the top of the bed and feet toward the bottom. We inhale and exhale dozens of times per minute with our eyes closed, our conscious awareness close to zero. Sometimes we even go to bed earlier than we’d originally planned in the hopes that Friday will come sooner, in the hopes that whatever misery we lived through during the day will end. We wait for bedtime and rarely, if ever, wait for the dawn to arrive like an arrow and arise us from our sleepy stupor, into a day new and whole and full of heart. We drown ourselves in sorrow like salmon swimming the wrong way inside the cool skin of a stream, just by waiting for the wrong thing. We spend more time waiting than we spend living. And if we spent more time living than we spent waiting, we’d be a thousand times happier. Our joy would ratchet up the Richter scale to new proportions. It would overwhelm the glaciers the oceans call home. It would make all those fresh tattoos bearable when the needle sinks into skin. So let’s live for Mondays. Let’s live for them like a child lives for a necklace of amusement park tickets, like a couple lives for that irreplaceable moment when some part of their bodies touch, even by accident, and they realize they’ve come home. Let’s live for Mondays and Tuesdays and Wednesdays too, for Thursdays, Fridays all over again, for Saturdays and Sundays and for every second our hearts send signals to our brains. 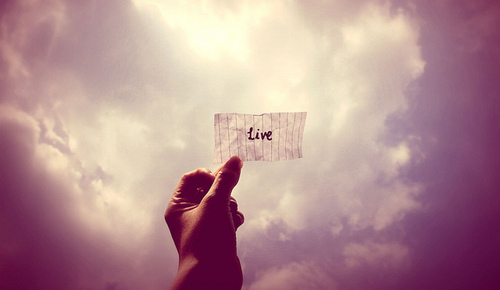 Let’s live and wait for every single day we’re alive. Let’s live and wait the same way we love: tirelessly and with courage, with palms full of hope and heads full of hoping. Let’s live for Mondays like we live for Fridays.